Microsoft has releases feature update to Windows 10 version 1803 to end users. The new free Windows 10 April 2018 Update(also known as Spring Creators Update) is now available for download as ‘Feature update to Windows 10, version 1803’. Unfortunately, some users are experiencing issues where feature update to Windows 10 version 1803 failed to install. Apart from this, the update also stuck for some users. We’ve collected few fixes and workarounds for these issues. Check out more details below. For blue screen errors, you can check your Windows Stop Code or stop error codes here. The new Windows 10 version 1803 update is big in size (2GB-4GB). If your internet connection is slow, it may take hours to download. WiFi connection is recommended. You can repeat this process with the Delivery Optimization service. If stopping the Windows Update service doesn’t bypass the issue on the first attempt, please re-try and stop this additional service. If feature update to Windows 10, version 1803 hangs on “Initializing…“, try the following workaround. Many times users report that after the installation of a cumulative update, Windows 10 start showing blue screen (BSOD) error or start reboot loop. 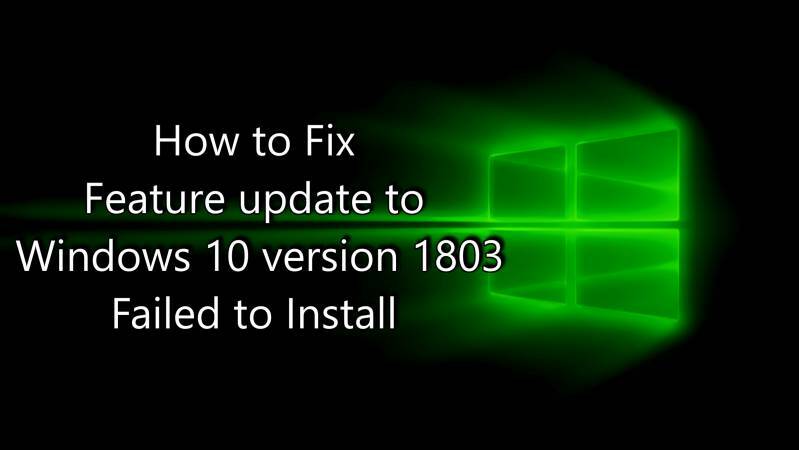 If the new feature update to Windows 10 version 1803 freezes and crashes after the installation, read here for fixes. The new feature update to Windows 10 version 1803 is a big update and the download may take some time. Furthermore, if you have limited data package, you should delay this update. Microsoft has provided a separate tool to disable updates or even drivers. You will find more details and download link here. If you want to install a fresh copy of Windows 10 April 2018 Update instead of updating your system. Now you can download Windows 10 version 1803 ISO image file from the link below. After exploring a handful of the articles on your blog, I truly like your way of writing a blog. I bookmarked it to my bookmark site list and will be checking back soon. Please visit my web site as well and let me know how you feel. lQQ6w5 This is one awesome article.Much thanks again. Cool. Oh my goodness! Impressive article dude! Thanks, However I am having problems with your RSS. I don’t know why I can’t subscribe to it. Is there anybody else getting identical RSS problems? Anybody who knows the solution will you kindly respond? Thanx!! Ahx4ke rencontre gratuit en belge How to get your customized blogspot to appear on google search? FX1PGE I think this is one of the most important information for me.